Tag Archives: George Tillman. Jr.
Story: The Longest Ride starts by making me feel like this is going to be a shallow feel because the selling point for Sophia (Robertson) to go and watch bull riding is ‘hot guys’ when she clearly doesn’t want to go. To the surprise of us all Sophia meets handsome rodeo Luke (Eastwood) and enjoys herself, well boy this is going to be a hard watch. When Sophia and Luke go on their first date they find Ira (Alda) who has had a car accident and the pair save his life and his box of memories. Sophia becomes friends with Ira (Alda) as she learns of the young love he once had. As Sophia and Luke learn about Ira’s love story theirs blossoms even though they both know they will be going in their separate ways. The Longest Ride gives us yet another one of these fictional love stories that would never happen but give people the unrealistic belief that it could. The only good part of this film is the flashback relationship that has the struggles going on throughout it. The leading love story is all about what you would give up for love and then boom easy happy ending no struggle to make things work between to pretty people, you know the type that annoys you. Britt Robertson: Sophia is a college student about to start her dream job in New York when she meets a professional bull rider. Her life is thrown upside down when she falls in love and torn between her lifelong dream or the man who has never made her feel like this before. Britt is good in this role playing you typical dream filled romantic character. Scott Eastwood: Luke is the professional bull fighter who has suffered a serious accident before he meets Sophia. He will not give up the ‘sport’ he loves even for the girl that changes his life. He is very traditional in how he goes about his relationship but also not willing to learn something else to get away from bull fighting. Scott is the highlight of this film where we see him make a name for himself in a leading role. Alan Alda: Ira is an elder gentleman that the two rescue from a car accident and who Sophia turns to for all of her advice when she learns of the love story he went through. Alan is solid in this role where we get to see him in a narration style role. Support Cast: The Longest Ride has a supporting cast with Jack Huston and Oona Chaplin playing the younger couple in the flashbacks who really shine above the rest. Director Review: George Tillman Jr – George gives us a good date movie but characters who are written to be too over the top and unrealistic doesn’t help the story. Romance: The Longest Ride gives us an unrealistic love story that is about two people coming from different worlds and what they will would give up for love. Chemistry: The Longest Ride doesn’t have the biggest spark between the lead couple which takes away part of the film. Settings: The Longest Ride has an array of settings which all give us how the class between Sophia and Luke comes through. Best Part: Ira and Ruth’s story. Worst Part: Opening scenes are unrealistic. Overall: Unrealistic story about love which will pull people in. Story Driver (Johnson) is released from prison, he is there because of a bank robbery gone wrong when his brother and himself get played resulting in his brother to be killed and Driver to be left for dead. Upon his release he sets on revenge firstly walking into a telemarketing office and shooting a man. This sparks the police into locating Driver. Lead by Cicero (Gugino) and druggie cop, Cop (Thornton) they start to investigate the crime. Someone sets a Hitman called Killer (Jackson-Cohen) to stop Driver only for Driver to always get the upper hand and Killer becomes more determined to win the battle. Set over five days can Driver get revenge for his brother’s death and stay one step ahead of Killer and Cop? Watch this fast paced action thriller filled with twists in the tale to keep you guessing all the way through. 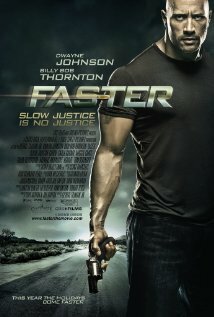 Verdict This top action thriller is very simple to watch never confusing its audience. Dwayne Johnson back in action roles works a treat even though he has very little lines his onscreen presences takes scene stealing to a new level. It’s classic double cross revenge storyline makes the action simple and a tidy car chase and shoot off between Driver and Killer are the highlights. It has an over the top feel to it which puts the realism on a backburner. All action thriller fans will enjoy this. Story Mark 8/10 Yes its been done before but a few different characters and a quirky Hitman add to a good story. Action Mark 8/10 Tidy action scenes using a few slow motion shots.